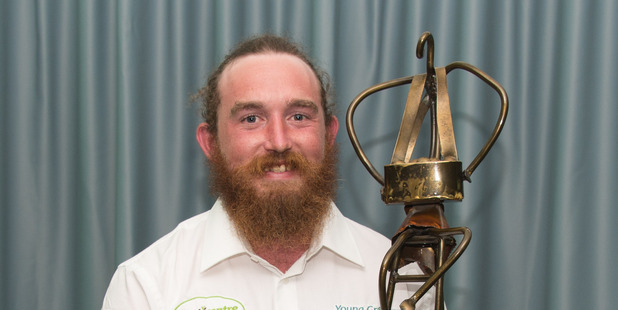 Mr Apple orchard worker Jordan James notched up his second win in a row when he was announced the Hawke’s Bay Young Fruitgrower of the Year at a gala dinner at the Napier Conference Centre on Friday night after some intense competition during the National Horticultural Field Day. With six years on the job under his belt, the 25-year-old again showed off the skills he had developed over that time, along with his level 3 national certificate in horticulture. At Showgrounds Hawke’s Bay Tomoana on Thursday last week, Mr James competed against seven other talented entrants in eight rigorous practical sessions. These were based on the day-to-day activities and knowledge of people working at the post apprenticeship level and ranged from pest and disease identification to business skills, chemical application and tractor safety and maintenance. At Saturday night’s gala dinner, competitors took part in a quiz and also gave a three-minute speech to an audience of about 220 people. Mr James said it was another great experience, topped off by the prize package worth about $5000 that he secured for his efforts. It was a triple win for Mr Apple, whose employees took out the top three places – Anthony Taueki, an orchard manager at Mr Apple, was runner-up, while Tom Dalziel, a foreman at Mr Apple, placed third. Mr Dalziel also won the prize for the best speech. Hawke’s Bay Fruitgrowers Association president Lesley Wilson said the competition was the closest it had ever been with very little between the contestants. “The calibre of the contestants was once again outstanding. This win was just the start for Jordan. On August 16 and 17 he will compete at the Horticulture New Zealand National Young Fruitgrower of the Year and, if successful, in the Young Grower of the Year. The prizes for this were worth $12,000 and Mrs Wilson said the Hawke’s Bay Association would be there to support Mr James all the way. She also acknowledged the endless time volunteers gave to the local competition. She also personally thanked those who had entered, including the competitors who were eliminated early on.